FELTON, CA (October 28 2014) Madrone Coast Farm is the first farm in California to achieve Certified Wildlife Friendly® status in recognition of its wildlife stewardship practices, following an ISO-compliant third-party audit process. “We feel that coexistence with wildlife, including mountain lions, is very important to the health of the local ecosystem. Farmers and ranchers can successfully use proactive practices to coexist with predators,” says farmer Alison Charter-Smith. 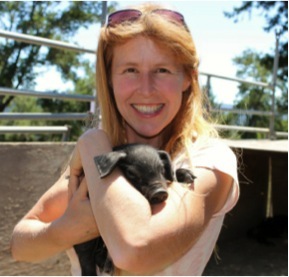 Charter-Smith and her husband, Tony Jaehnichen, raise heritage chickens, ducks, goats, sheep, and pigs, and offer pasture-raised chicken and duck-eggs, pork and wool at 4 farmer’s markets throughout the Santa Cruz area. The vast majority of their farm is wooded and accessible to wildlife, including 3 juvenile mountain lions seen on the farm this past summer. In addition to maintaining ponds to provide water, Charter-Smith and Jaehnichen are working to increase the habitat value of their land for terrestrial and avian visitors alike. The farm has nesting boxes for swallows, bats, owls and bees. Black-tailed deer, coyotes and bobcats are also in the vicinity. “The Certified Wildlife Friendly® label helps consumers to vote with their pocketbooks. Consumers can now support free-ranging wildlife as they buy from local farms,” says Julie Stein, Executive Director of the global Wildlife Friendly Enterprise Network. 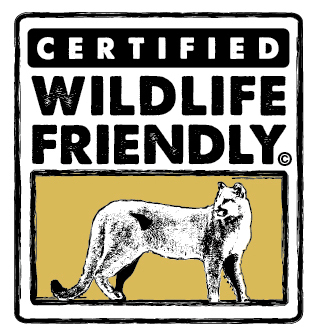 Certified Wildlife Friendly® farms and ranches support wildlife, biodiversity, and a host of ecosystem services. Madrone Coast Farm is now also certified by the Animal Welfare Approved program, the most highly regarded food label for animal welfare and pasture-based farming. Ackowledged by Consumer Reports as a “highly meaningful” food label for farm animal welfare and sustainability, AWA certification lets consumers know the animals at Madrone Coast Farm are managed under high welfare practices. The farm’s Animal Welfare Approved and Certified Wildlife Friendly® audits were carried out concurrently, through an agreement of the programs. “Pumas need 50-150 sq. 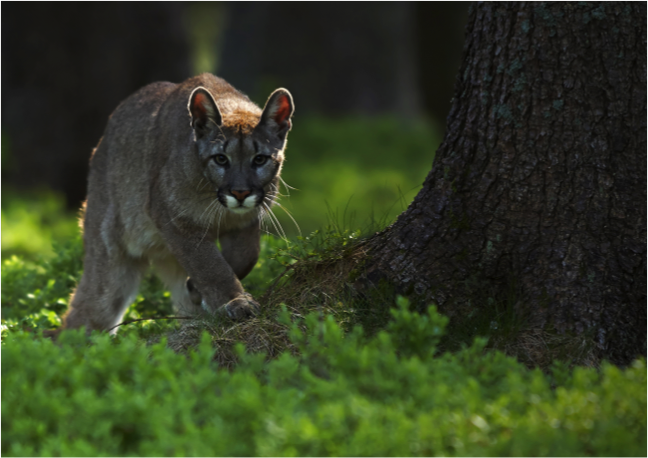 miles to make a living in our area,” says researcher Veronica Yovovich of the Santa Cruz Puma Project. Private land corridors–such as the one Madrone Coast Farm provides–are an important to their success. By being proactive about protecting livestock and contributing to habitat, Certified Wildlife Friendly® farms help predators remain in areas where they can carry out their living as they have for centuries, quietly, behind-the-scenes, and for the most part undetected across the patchwork of wild, rural and developed areas of the Santa Cruz mountains. Through education and personal actions” says Yovovich, “people can live safely with mountain lions”. Animal Welfare Approved audits, certifies and supports farmers raising their animals according to the highest welfare standards, outdoors on pasture or range. Called a “badge of honor for farmers” and the “gold standard,” AWA is the most highly regarded food label in North America when it comes to animal welfare, pasture-based farming, and sustainability. All AWA standards, policies and procedures are available on the AWA website, making it the most transparent certification available. Animal Welfare Approved’s Online Directory of AWA farms, restaurants and products enables the public to search for AWA farms, restaurants and products by zip code, keywords, products and type of establishment. In addition, AWA has published Food Labeling for Dummies, a regularly updated guide to commonly used food claims and terms, available free for download at www.AnimalWelfareApproved.org.